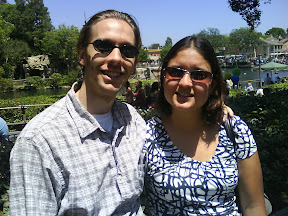 Last weekend on Saturday after Flor finished up with her 2nd year of med school, we had the pleasure of heading up to LA to meet my family for a rousing day at Disneyland. We had a fantastic time taking in all the sights and riding all the rides while enjoying short lines on a Memorial Day weekend. In fact I can't even remember the last time that my family got together for something like this... maybe last Fall when we hit up the Charger's Chiefs football game but that just seems somewhat different in my opinion. The last family vacation like this was probably back before I moved out of the house if you take weddings and the like out of the equation. Anyway, Jim was there to join us as was my sister Kathleen. For around three years now the family outings have been lacking Kathleen because she was living in Boston so it's been great to have her around again. 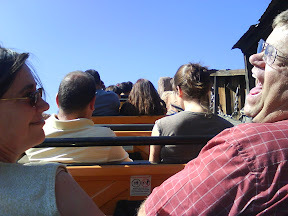 Anyway, I'm not going to say too much about Disneyland because we all know about the place but I will say that while we were there we were treated to an exceptionally long ride on the Pirate Ship. 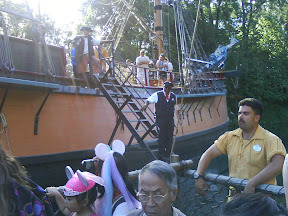 It's not really a pirate ship though, it's actually a replica of the first American ship to circumnavigate the globe. The replica now circles the pond/river there at Disneyland every day while guests take rides like they would a roller coaster. Well, we were no different than any other group of riders except that on our ride the motor on our boat went out and we were stranded about 15 feet from the shoreline for about an hour and half on this boat. We ended up having to be rescued one by one down a ladder onto the Mark Twain River Raft. Keep in mind this ship supposedly circumnavigated the globe... I guess they worked better before they threw motors into them. Apparently the Disneyland model doesn't have sails. Eventually of course we got off and they treated us to some fine bottled waters on the house as well as some complimentary front of the line passes for our troubles. Lets just say I'm glad none of us had to go to the bathroom while we were on the boat; that would have been some significant trouble. It's hard to complain though because we got to do pretty much everything we wanted to do on the day despite the lost 90 minutes. I will also say I had so much fun spending time with my dad on roller coasters; I honestly can't remember riding a roller coaster with him for some reason. It makes me smile thinking of it. I took a lot of pictures during the day and I thought I'd share a few of them here. 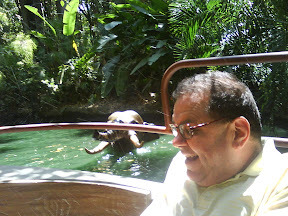 Note the awesome picture of my uncle Jim squealing like a five year old girl at the fake elephant behind him on the Jungle Cruise. Hehe, I love it! 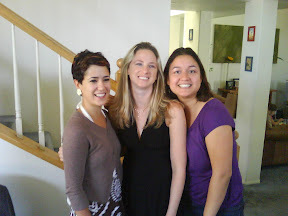 On a side note, Flor and I hit up Loma Linda the following day and saw Carolyn Sharpe and her family on Sunday. She just graduated Medical School and is now a doctor! Congratulations Carolyn!